If Bumble Bees Can Fly, Why Can’t I? I proceeded to tell my son about the bumble bee. I explained that it is aerodynamically impossible for the bumble bee to fly. Their bodies are way too big, and their wings are way too small to carry their little bodies through the air. Yet, they still fly. This was probably so because their ‘bumble bee mommies and daddies’ never told them they couldn’t! 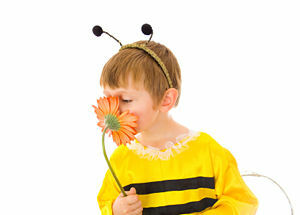 So, bumble bees fly through the air, never knowing that it is by scientific standards impossible. My husband looked at me and said, ”If he jumps off the roof, thinking he can fly, and lands on his head and breaks his neck, I’m holding you personally responsible.” I laughed, and said, “Point well taken”. But, it did get me to thinking: how often do we hinder our children? Some of us have psychic children. Are we interested in helping them to develop their abilities? A large part of society is not so open to this. What would happen, for example, if I were to go to the psychiatrist and tell him that I see and talk to ghosts? If I asked him what he thought of that, he would probably say something along the lines of, “I believe, you believe, that you see ghosts”. Then he would more than likely put me on some sort of medication for schizophrenia or some other psychiatric disorder. If I further told the same hypothetical psychiatrist that I entertained the idea of my children also seeing and talking to ghosts, he would most likely call Child Protection Services, to tell them I’m off my meds and my children should be removed for their own protection. For these reasons, I have found myself saying to my children, “Shush….not here”. I explain to them not everyone can see what they see and hear what they hear, and that they may be scaring people. I remember my mother telling me the same thing, when we entered into a friend of the family’s house. I instantly picked up on the previous owner’s name and the fact that he was concerned about his son George. When they later pulled out the blue prints of the house sure enough, I had the names correct. My mom then told me to hush, as they weren’t open to what I was seeing. Is it this sort of thing that causes our children to lose their psychic abilities? I believe it is. But, I too am guilty. Of course, we don’t want to encourage our children to jump off the roof in the hopes of flying. But, until more of society is spiritually aware, I don’t believe that our children will be allowed to develop and to progress as the human race was meant to. Don’t get me wrong. I believe there is a spiritual awakening occurring within each of us. And, it is happening quickly. But, if all of us open up our minds and aren’t so quick to judge that which we don’t understand, the process will take place much more quickly. 3 Responses to If Bumble Bees Can Fly, Why Can’t I? I love the story of the bumblee. I have used this example in lectures and it is amazing how startled some people look when I tell them this story. And it is so true! Hope you are doing well and God bless. Thank you again Dr. Rachel, you are definitely one of my favorites!